Also see www.notransmilitaryban.org for the latest information. Update August 24, 2018 – Federal District Judge Colleen Kollar-Kotelly today issued a ruling ordering the Trump administration to disclose information about its decision to ban otherwise qualified transgender troops from military service in Doe v. Trump, GLAD and NCLR’s case challenging the Trump administration’s transgender military ban. Update June 22, 2018 – GLAD and NCLR filed our reply in support of our Cross-Motion for Summary Judgment in Doe v. Trump. If Judge Kollar-Kotelly rules in favor of the plaintiffs, that decision would permanently block the Trump-Pence transgender military ban from ever taking effect. 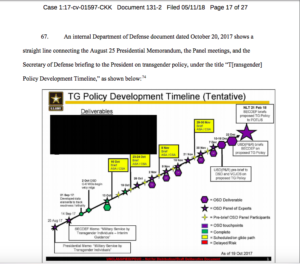 Today’s filing rebuts the administration’s attempt to “blinker reality and recast the Mattis Plan as something other than what it plainly is: a blueprint to ensure that no transgender individuals serve in our Nation’s Armed Forces ‘in any capacity.’” The plaintiffs’ reply is the last in a series of filings that must occur before Judge Kollar-Kotelly determines whether she can issue a permanent ruling blocking the ban. Update May 11, 2018 – Transgender military ban plaintiffs in Doe v. Trump filed a cross-motion for summary judgment in U.S. District Court for the District of Columbia. Plaintiffs’ motion asserts that undisputed facts show the ban, including the March 23 Mattis implementation policy, violates their Equal Protection and Due Process rights, and that the court should provide permanent declaratory and injunctive relief to prevent the Trump-Pence ban from ever being implemented. Plaintiffs also filed separate motions opposing the administration’s motions to dismiss the case and to dissolve the nationwide preliminary injunction issued October 30, 2017 by District Judge Colleen Kollar-Kotelly of the United States District Court for the District of Columbia. Tthe Trump administration’s March 23 “Mattis Plan” excludes transgender people from service based on their transgender status, rather than on any medical basis. Read more on this filing. This letter from the American Medical Association follows recent comments supporting military service by transgender individuals from two former surgeons general, as well as a statement from the American Psychological Association. Update March 23, 2018 – On March 23 the Trump administration filed implementation plan details for Trump’s transgender military ban. The plan has no immediate effect, as the nationwide preliminary injunction – stopping the ban from moving forward – issued in Doe v. Trump and in three other cases, remain in effect. The March 23 plan is the same categorical ban which singles out transgender servicemembers and would result in the loss of highly qualified and trained troops. Update December 30, 2017: The Trump administration dropped its attempts to delay transgender enlistment after repeated court losses in GLAD and NCLR lawsuits. The Pentagon confirmed that the military will begin accepting qualified transgender military recruits after January 1, 2018. This marks the first time in United States history that qualified transgender Americans will be authorized to openly enlist in the nation’s Armed Forces. The Trump administration also dismissed existing appeals of three preliminary injunctions issued in cases filed to stop President Trump’s transgender military ban, including in Doe v. Trump. The administration had not yet filed an appeal of the December 22 preliminary injunction secured in NCLR and GLAD’s second case, with Equality California, Stockman v. Trump. The Department of Justice has indicated it will continue opposing legal challenges to the ban in federal district courts. For transgender Americans ready to enlist, read our guide for more information on the enlistment process. Update October 30, 2017: Today, the U.S. District Court for the District of Columbia ruled in favor of the plaintiffs and enjoined the transgender military ban, the discriminatory policy challenged in Doe v. Trump, the first case filed against President Trump’s transgender military ban. What does this mean? Read our FAQ. Update October 16, 2017: GLAD and NCLR hit back at the Trump administration’s defense of its transgender service ban in the United States District Court for the District of Columbia. In our brief refuting last week’s Trump Administration claims that no harms have resulted from the ban, we demonstrate to the court why Interim Guidance issued by the military does not protect transgender troops from the irreparable harms the ban has been inflicting on them since it was announced in July. We urge the court to stop the ban now, before it takes full effect in March 2018. Update: October 5, 2017: The Department of Justice responded to GLAD and NCLR’s motion for an immediate stop to President Trump’s transgender military ban. In the government’s motions to dismiss the case and oppose the plaintiffs’ request for emergency relief, the Trump administration falsely claimed transgender individuals have not yet suffered harm from this policy. GLAD and NCLR, who are set to respond to the government’s motions in court later this month, reiterated the compelling need to put an immediate halt to the ban: transgender Americans looking to enlist are not able to do so, and currently-serving transgender servicemembers have been demeaned and stigmatized, denied health care, and are facing the loss of their professions, livelihoods, health care, and the post-military retirement they have worked hard to earn. Update August 31, 2017: GLAD and NCLR filed a new motion for urgent, immediate halt to President Trump’s transgender military ban, and amended our initial complaint to include two new named plaintiffs: Regan Kibby and Dylan Kohere, respectively a midshipman from the U.S. Naval Academy and a student enrolled in the Reserve Officers’ Training Corps (ROTC). Powerful declarations in support of the motion for preliminary injunction from these new plaintiffs and from top military officials from the Army, Navy, and Air Force outline why leaving this ban in place would irreparably harm transgender servicemembers and their families and undermine national security. GLAD and NCLR have filed a lawsuit in federal court in DC challenging President Trump’s directive to reinstate a ban on military service by transgender people. President Trump is needlessly attacking courageous transgender service members who put their lives on the line for our country. Trump’s efforts to reinstate the ban are already harming service members, who have been blindsided and are scrambling to deal with what this means for their families and their futures—including the loss of job security, retirement benefits, healthcare, and other serious harms. The military itself carefully studied this issue and concluded that there is no reason to bar transgender people from military service. Since the Department of Defense announced in June 2016 that transgender people can openly serve, thousands of transgender soldiers have come out and are serving openly. Our country is safer and more secure because of their service. We represent five active duty service members who came out as transgender to their commanding officers in reliance on the Defense Department’s June 2016 announcement that transgender people can now openly serve in the military. The lawsuit asserts that President Trump’s directive to ban transgender service members violates the equal protection and due process guarantees of the federal Constitution. We argue that Trump’s policy was enacted to discriminate, not to serve any legitimate purpose. It directly contradicts the military’s own careful, recent conclusion—reached after a comprehensive review process—that there is no reason to ban transgender soldiers from serving. The lawsuit also claims that the military cannot promise transgender soldiers that they can serve openly, encouraging them to come out to their commanding officers, and then pull the rug out from under their feet. The law prohibits such unfair conduct. In addition to GLAD and NCLR, the plaintiffs in Doe v. Trump are represented by lawyers from Foley, Hoag LLP and WilmerHale. Transgender Military Service in The U.S. If you are or could be affected by a change in military policy, please contact us.